Independent rental in main residence. Furnished T-3 non smoking, in CONQUET, with closed garden and private carpark, all in edge of sea with impregnable view on the islands of the Ponant, the peninsula and the lighthouse of KERMORVAN. Beachfront rental with a veranda has two large windows, a terrace with picnic table, all with exceptional views of the sea Iroise, located in a privileged and quiet location at 3 Corniche Beg Al Louarn classified in pedestrian walkway and start of the coastal path GR34 for walkers to the beaches of Bilou, Porsliogan, La Greve Bleue, Pointe de Penzer and Pointe Saint-Mathieu. You can move on foot because we are in the immediate vicinity of PORTEZ beach, the fishing port, marina and the ferry terminal for the islands of Ouessant and Molène. Departure of sea trips on the archipelago of Ponant. Beach Wear has been awarded the 'Blue Flag', a symbol of environmental quality. The premises of the Marin d'Iroise park are located on the former LECONQUET-RADIO site at Pointe du Renard. Indoor parking in the rental. 1 bathroom with large shower cabin and walk-in without walk of 1mx1m very practical. 1 independent toilet. 2 shower towels, 1 shower mat at your disposal. A small dryer. Terrace and veranda with breathtaking views of the Ponant Islands. Seaside, near the port of Conquet and the ferry terminal. A 1 minute walk from the BEACH beach. In the kitchen: dishes with 18 cutlery, cooking utensils; kitchen gloves, tea towels, towel. Equipment: stove with gas oven, toaster, fridge. Dishwasher, microwave, kettle, coffee maker. TV, radio, iron. Vacuum. Bedding: Optional -BB bed. Optional BZ sofa. Use of washing machine, and collective dryer. Gas barbecue (in summer) in the garden. In the terrace, a picnic table in concrete. Two relax chairs (in summer). Cleaning not included. Cleaning option with fixed price. Dog allowed with consent of the owner 40 euros additional fee. Cats not allowed. We stayed in this apartment for a week in September. It was very well equipped, with two lovely double bedrooms, a big shower room and lots of storage. The kitchen was small but had everything you would need. The apartment was spotlessly clean and well-decorated.The views are stunning, and the windows in the sitting room are very large. The owners live next door, and are very friendly and helpful. We really enjoyed our stay and hope to return soon. 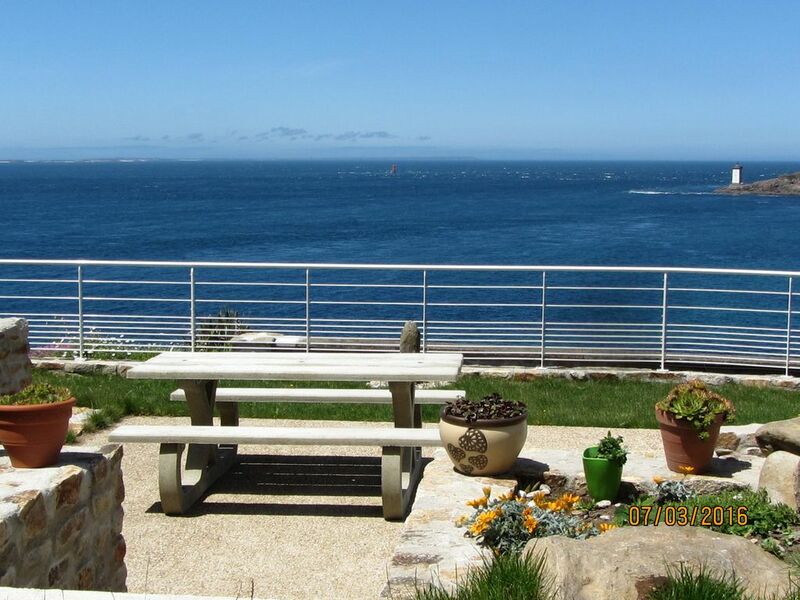 "Spotlessly clean, quiet, beautiful views from the window of the lighthouse and the sea, good walks from the house. Access was good with safe parking at the rear. Owners were very friendly and helpful. Amenities were more than adequate - although there was a washing machine avilable for use I would have preferred one in the flat." Que dire de cette location? Nos hôtes nous ont accueillis avec beaucoup de gentillesse et de simplicité. Le logis est très propre, agréable et très bien équipé. Enfin cette location offre une vue remarquable tant de la terrasse où nous déjeunions que du séjour. Quel bonheur que d’ouvrir les volets chaque matin! bel endroit avec une belle situation prés de la mer et une très belle vue avec accueil très chaleureux des propriétaires. Vue extraordinaire,confort douillet,espace et calme. Très belle semaine au Conquet ! À réitérer ! Excellent emplacement et propriétaire très accueillant. Petite maison parfaite, proche des commerces. Aucune nuisance provenant de voitures ou du voisinage. Une excellente adresse!